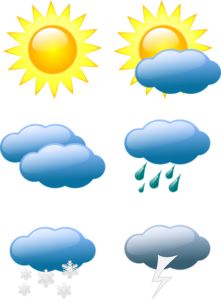 Weather conditions can have a huge influence on campers and RVers so they tend to be people who pay attention to weather reports in the areas they plan to travel. For those who are on a long vacation or enjoying a nice wander through AZ, it’s possible to delay a trip for a few days or leave a tad early to avoid weather that can make travel challenging or change a destination to one that favors sunny days. Fortunately, today’s technology is excellent at providing some very reliable weather apps for tracking what is going to happen with the wind, rain, or snow in any area you choose. We found three that you might like to try as you enjoy camping throughout AZ. NOAA Radar Pro offers a real-time animated radar image on an interactive map. It will send notifications to you which can be very helpful as you’re driving. This app is free for Android users and costs a small fee for IOS. Yahoo! Weather will provide you with beautiful images of your chosen location as well as five-day forecast to assist you in your planning. It’s user-friendly and free for all users. 1Weather will provide hourly, 10-day, and 12-week forecasts. It’s long been a favorite of Android users and now is available for IOS as well. We want all your camping days to be sunny and warm but it stands to reason that you will experience some challenging weather if you camp long enough. These apps can help keep you informed and away from potential weather problems on your trip. You can find out more about these apps and a dozen others at 15 Best Weather Apps. Going AZ Camping? What’s The Best Lantern To Take Along?